Anyone who has experienced the wrath of a fire as it devours trees, houses and anything in its path, will realize the important role fire hydrants play. They are located in spots which are easily identified and accessible to firefighters and fire engines. They are also found in buildings along with fire extinguishers, sprinkler systems and fire hose reels. Hydrants transport water in order to limit the amount of hose that firefighters need to use in order to speed up fire fighting. Fire engine hoses are hooked up to the hydrants for a supply of water that the fire engine supply may have already run out of. The pressure available to fire hydrants is important, and there must be enough pressure so that the fire hoses are able to force the water to break into fine droplets. The pressure also needs to be sufficient to allow multiple fire hydrants to operate at the same time. Fire hydrants are used by experienced and trained firefighters, and because of the high pressure available, untrained people can be seriously injured if they try to use hydrants. Fire hydrants are mostly identified by certain colours and this gives the fire fighter an idea of the water capacity of the hydrant and to also identify the water supply system that the hydrant is connected to. Fire fighters need to know how much water is available from the hydrants in order to choose the correct size hoses for the fire. They need to know the water pressure in each hydrant, which varies significantly with each one. The fire hydrant’s colour is easy to recognize and blue for instance represents a very good flow while red will mean inadequate. Most Australian fire hydrants are underground; a spring hydrant type, and hydrant signage is important simply because they are more concealed than hydrants found elsewhere. Fire hydrants need to conform to fire safety requirements and undergo regular testing by efficient Fire Protection Services. Local Fire is a Sydney based firm who design, install, repair and maintain fire protection systems which protect property, people and businesses from destructive fires. Thousands of people are injured and die as a result of fires, and billions of dollars are lost because of damage to property. Local Fire are accredited and licensed and they know the nature of fires intimately. They know exactly how they start, how the smoke affects people and how buildings and property need to be protected. They look at risks in buildings and suggest ways to prevent them. hydraulic flow rate testing is conducted annually to check the fire hydrants performance. They need to be maintained so that a fire fighter can wrench them open in order to connect hoses to the opening ends. Today’s fires are like enraged monsters, bigger and more dangerous than ever. Burning embers drop on people, animals shriek in terror and paramedics have to rush in through billowing smoke with respirators and defibrillators to reach injured people. The potential for fires in industrial environments and businesses is an ever present threat, and efficient flame detection is vital to a business. 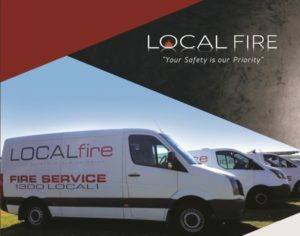 Local Fire are qualified and experienced specialists who have all the skills and experience for the installation, certification and maintenance of fire fighting systems. They assist the community and businesses in accordance with Australian Standards, and with their industry experience and expertise they can protect your business against the devastation of wild fires and ensure it meets all regulatory obligations.